Let’s face the ugly truth – part of Apple’s success, as much as you might dislike them (we’re neutral here), is due to their slick marketing as well as products that basically work right out of the box without any hassle. Also, they not only work, but are extremely easy to use, where anyone without a computing background is able to figure out the nuances pretty quickly without having to refer to a manual. Apart from that, their successes over the recent years also included the introduction of an online store, which sells everything from hardware all the way to software and media content, without requiring you to make a trip to the nearest brick-and-mortar store if you’re so inclined. 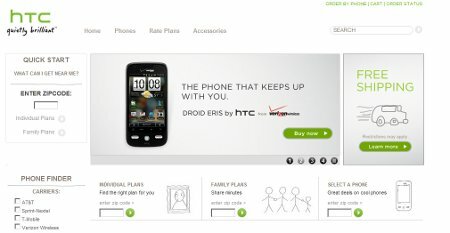 HTC must have taken a page out of Apple’s book by finally making a similar step, by introducing their very own online store that sells HTC devices as well as accessories. Sure, they’re lagging behind on the software and media content front, but hey, it is a start, isn’t it? The new HTC e-commerce site is situated at www.shopamerica.htc.com, where you will be able to browse and purchase from a wide range of HTC phones as well as accessories. Apart from that, you can also take the opportunity to activate your new handset by choosing a rate plan from one of the four nationwide U.S. operators – for those who are more tech savvy, this sure beats having to navigate several “layers” of human interaction, including dealing with less than well trained sales personnel and the ilk. Whenever you access the site, all available devices can be filtered by carrier, type of rate plan and desired features. Once you have made up your mind and have gained the approval from your missus to part with some hard earned money, activated devices and accessory orders of at least $50 are sent right to your doorstep without any shipping fees. HTC is also offering a 15-day money back guarantee that enables any equipment purchased online to be returned within a similar time frame without any additional cost. Also, customers have the option to finalize their purchases over the phone. If you have been hankering after some accessories for your HTC smartphone but have failed to do so so far, the online store also holds a wide selection of hard-to-find accessories for customers looking to truly personalize their mobile experience, where they range from wrist straps and gel skins to home audio cables and international travel kits.